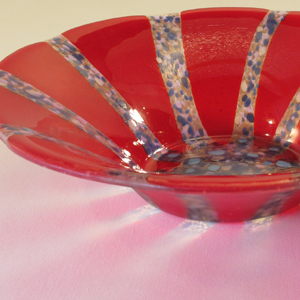 During one of our early spring exhibits, a visitor told me how much he loved Swiss chard. So I bought a package of mixed-color chard seed and planted a row along with the other early spring crops. We had grown Swiss chard only once before, decades ago, after friends told us how much they loved it. Did I serve it raw in salad or cooked? I don’t recall, only that we didn’t understand how chard could be Trudy and Jim’s favorite vegetable. Nobody in our family liked the chard much less loved it. So we never planted it again. This June we began to understand at least some of Swiss chard’s appeal. It’s nutritious, tasty, pretty, and is ready to pick when earlier salad greens are fading. Every spring we plant green and red loose-leaf lettuce, arugula, kale, and spinach as soon as the soil is ready. By now the arugula is going to seed, spinach is starting to blossom, and lettuces will soon get tough. The chard started a little later and is holding up well to what little early summer heat we’ve had. It complements the waning spinach harvest when I want to make a salad. 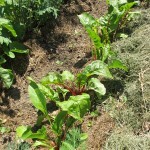 Chard can be prepared the same ways as spinach, either serving it raw in a salad or cooking it. 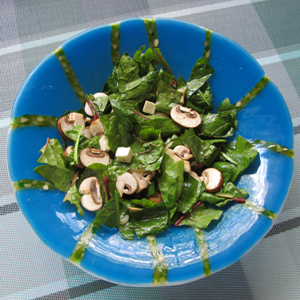 My favorite way to eat spinach is as the feature ingredient of a salad, using a recipe served us by a Wisconsin friend. I think the recipe goes all the way back to a visit while Pat and Bob lived in Lake Forest, Illinois. We met as newly- and almost-newly-married couples in a Chicago church group which disbanded as everyone moved out to the suburbs or further (in our case to South Dakota) with our growing families. Pat’s Greek heritage seems evident in the recipe, which includes a delicious vinegrette dressing that’s good on other greens, too. In the past few weeks I’ve been picking equal amounts of spinach and chard to make the salad. I cut up and add the colorful chard stems to the salad, too. Divided among two or three people and served with Jay’s Green’s and Grits bread and orange marmalade or a fruit jam, it makes a delicious and nutritious lunch. Put in a jar and chill. Keeps well in refrigerator. 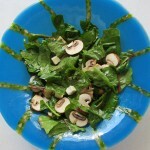 When ready to serve, add some of the dressing to the greens mixture and toss. Serve in a bowl that sets off the green tones of the spinach and chard leaves (such as “Blue Swirl with Green Rimations”) as a main feature with bread or as an accompaniment to dinner.